And We’re Back! Prepping for my next Lamentations of the Flame Princess game! | Tales to Astound! And We’re Back! Prepping for my next Lamentations of the Flame Princess game! When we last gathered, the Lamplighters were making plans to go to the keep of an interdimensinoal explorer named Rudolph Graupher. Graupher has the means of traveling to alternate earths. And one of these earth is being sought by sorcerer’s from Carcosa looking for a canister full of Akkom in the Qelong Valley. If they find the Akkom they will be able to open a portal that will let armies march with their gods across space from Carcosa to to 17th Century Europe. The Lamplighers want to stop this. (Forgive me, by the way, for not doing a more detail recap… But everything is building on everything else from months of play. If you want to understand what this all means, I can only recommend going back to previous eateries using the Lamenations of the Flame Princess tag.) And so they want to find the method of getting to the Qelong Valley on an alternate Earth. They sought out Graupher, found him dead in Berganzel (Scenic Dunnsmouth), but gained the clues they needed to get to his keep where he and his men live in the Alps. I wanted a few things for this next location. First, I wanted something that could serve as a base of operations for the Player Characters if they so chose. I went online and found something I thought would make sense as a base of operations for an interdimensinoal explore and found the map posted immediately above. I thought it was exactly what I was looking for, nestled in the Alps, ready to defend against anyone who might come after Graupher, his hardy adventurers, and the treasure they had gained traveling between worlds. Second, because of this, I wanted it to be a challenge when they arrived. I had decided to kill off Graupher before the PCs found him, so that he could not become their exposition machine. I didn’t want an NPC handing them solutions and explaining everything. I wanted the puzzles and mysteries to be there for the Players to sort out. For this reason, I decided that by the time the Players reached Graupher’s Keep, all of his men would be dead as well. Why? How? Had the sorcerer’s from Carcosa gotten there first? I decided no. Because, third, I wanted something disconnected from the overarching plot that had been growing over six months of play. And that’s what happened. 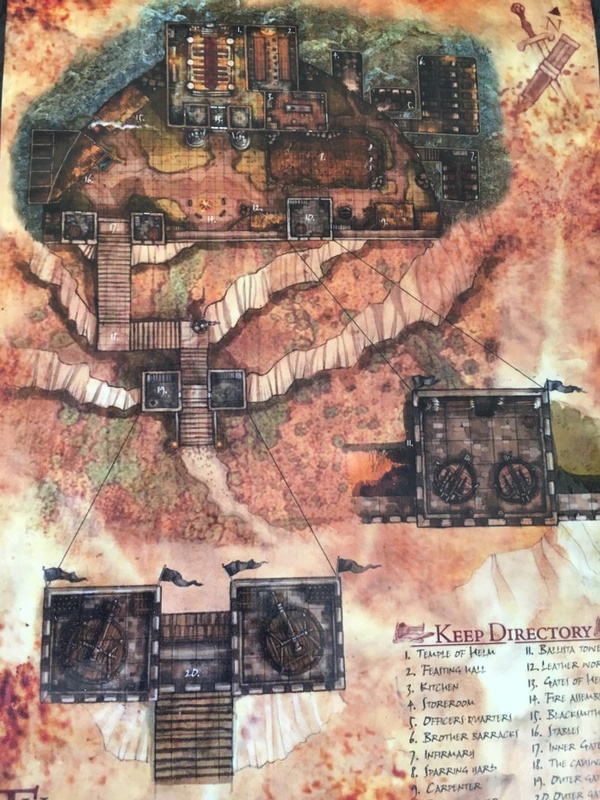 I decided the large temple area on the map above was actually a menagerie, one of the beasts escaped, a series of mishaps occurred where more beasts escaped… and soon almost all the beasts had killed each other and Graupher’s men. In this way, by the time the Player Characters arrive they will find the scene of horrific carnage. But, they will also be dealing with the aftermath of this… beacue I knew at least one beast would still be alive for them to deal with. What would the beast be? I wanted something unexpected, strange, and kind of fucked up. I mean, it had to be worth carrying back from another dimension, right? And I wanted, as always, something that could throw my players off balance. I opened up Raggi’s Random Esoteric Creature Generator and after a few rolls conceived of a beast that works a little like a basilisk, but instead of turning you to stone, manifests the dreams in your head. And when I say that, I mean, something that you dream begins to grow and become real, growing until it is its natural, real size… usually splitting your skull open from the inside out and killing you. I liked this a lot not only because it is weird but because before they encounter the beast they’ll be finding the corpses of men lying dead with thei skulls split open from the inside out. “That will give them pause,” I thought! Adding to this, I deduced that there would be several magical pockets in the keep, where the dreams from the dying men had altered reality. If the PCs entered these pockets, they would fall into those dreams. This led me to think that this might be one of the ways you could kill the creature effectively. That is, in this world if the creature strikes you or you meet its gaze it can make your dreams start growing in your skull. But if you meet and defeat it in the realm of dreams, its magical power is no longer effective. What would these dreamscapes be? How would I make them feel otherworldly? 1. A one-page dungeon entry I had read months ago, in which the PCs are shrunk down to mouse size in a wizard’s lab. 2. The game Puppletland, in which the PCs play puppets on their own after the puppet Punch murders their maker and lords over the puppets in the workshop. 3. The game Wolfspell from Issue 2 of Worlds Without Master. In the game, humans take on the forms of wolves to complete a quest. Their new, animal nature is in a tug of war with their human blood. I liked 2 and 3 in particular because we would be using new rules. This would add to the strangeness of getting tossed into a world of dreams. So, in the first case, the PCs would be entering a room and see the miniature bodies of men who had died in the dream of being tiny. In the second, they would see a tattered puppet state and various puppets lying around it like corpses. And in the third, the would see ahead of them the savaged bodies of wolves. To approach these things would mean entered the world of those dreams. But it would also mean a better chance at killing the beast. Finally, Graupher’s keep proper. I wanted something special for this as well. He is guarding an incredible magical technology–the ability to travel between worlds–and I wanted something special for that. 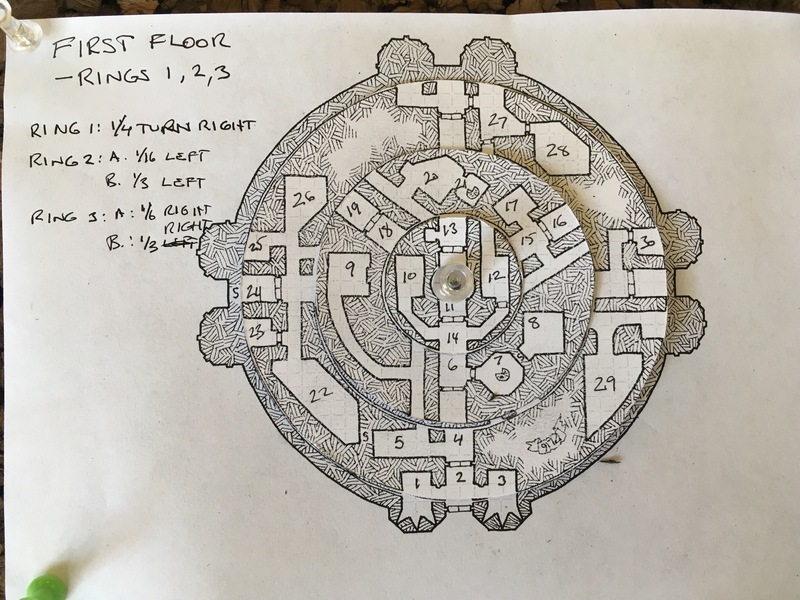 I had come across an amazing map at Dyson’s Dodecahedron called The Turning Tower. The tower consists of three rotating, concentric sections and is three stories tall. There are levers in the center room of the first and second floors. By pulling the levers, one can control the motion of the sections. Following a lead by a poster at G+ I printed out the sections on card stock and mounted them on a cork board to track the mapping during play. Note that depending on how the sections are aligned, certain parts of the tower are inaccessible, and others suddenly lead across the structure. But per the original write up, the controls can only be used once every hour. 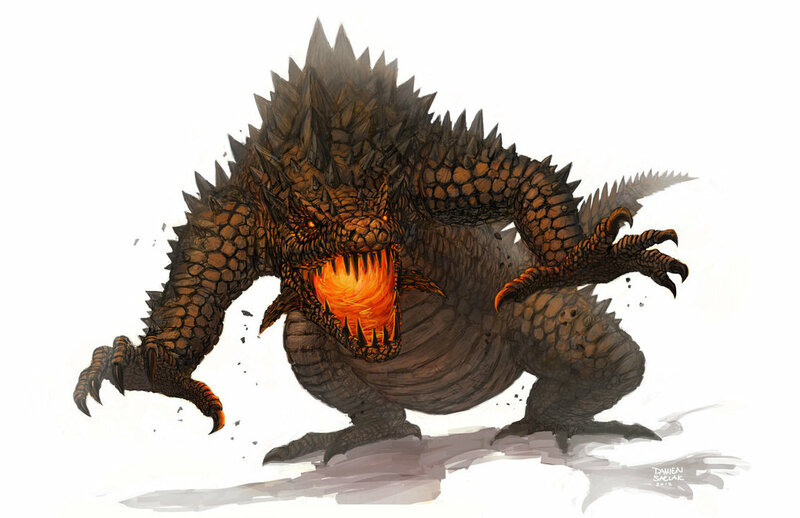 But more that that–several of Graupher’s men are infected, rabid men trapped inside the keep’s fortress. As the PCs manipulate the levers they will be allowing the doomed men to rush for them… or to keep them at bay with carful manipulation. The image of the levers is there to a) provide quick, dramatic focus when they first find the levers, and b) allow them someplace safe and obvious to make notes about the results of pulling levers as they experiment. Okay, that’s the basic gist. I still have to sort out what is in the rooms of the Turning Keep. But that’s what I’ll be working on this evening after I get some work done around the house. I wanted something that would really feel like the Players had earned the keep if they captured it. I think I’m on my way. Oh, and the technology that lets you travel to other worlds? If you get to the lowest level of the Grauphr’s inverted tower, you will find a tunnel leading into the Alps. There you will find an underground lake. And on the waters of that lake you will find a three masted ship. If you turn the wheel in a certain combination, right, then left, then right, and so on, with a different combanation for each world, you will find yourself on the waters of an earth that is an earth, but not our earth. 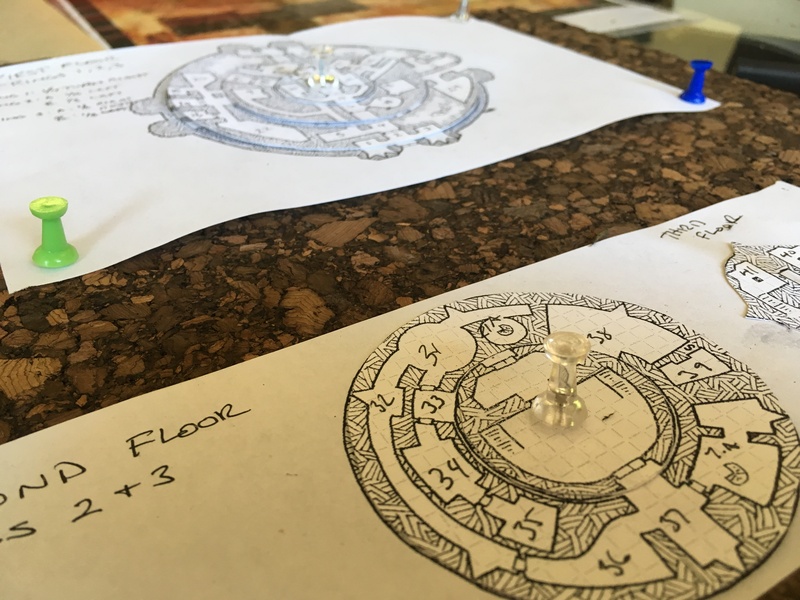 Nice to see someone else using the Turning Tower 🙂 It may have been my game on G+ you saw – Dyson shared it around after I ran it and one of my players took photos. It was your game! I meant to dig it up, but that post took so long to type up I had other things I had to get to! The pictures were very inspiring and I thought, “I have to use that somewhere.” And then I realized that for Graupher’s Keep I wanted one more weird thing in addition to the dream monster. No worries 🙂 Glad it inspired you! I’m just thankful that Dyson’s making awesome maps like that, to be honest. I may be having a stupid day, but when I tried following the links to your lamentations campaign I seem to go around in circles. Are the links working correctly, or am I just going blind? I’m curious because I’m running a 17th century campaign, based on the Flashing Blades rules and …other inspirations (RQ2, Cthulhu, Nephilim in the main. Perhaps with a touch of Space:1889 for an ‘in the future’ interlude. So seeing what you’ve done would be interesting. Thanks for the detail on where you’re getting inspiration from. I think I may have been missing a few good resources that are out there. And perhaps I’m being a bit conservative too. Can you tell me, specifically,, which links you are referring too and where they take you? I’m more than willing to believe I’ve created some screwed-up links, but of those I just checked, things seem to be working properly. But if something is broken, let me know. I really do want to get whatever is broken fixed. Clicking on “Lotfp Fallen World Campaign” link in the menu bar that runs horizontally across the screen, under your widescreen pic that sits under your web page title, takes me to the web page with the picture of the woman with tentacle hair. I assumed that was this link: “I’m currently running a Lamentations of the Flame Princess campaign with six terrific players” Clicking on *that* link just gets me to your post of 25 August 2016 “Referee Screen Sheets for Classic Traveller and a Smart Referee Screen”. Clicking on other “Lamentations of the Flame Princess” within that article don’t do me any good either. Just seem to go around in circles. I can see that now in this post (and I mayn’t have noticed in other posts) you’ve got related posts pointing to your Lotfp campaign. They work for me. Might be that browsing from my iPad doesn’t show me as much. I much prefer browsing on my mac – makes typing replies easier too 8-). When you click on the LotFP under the site’s banner it leads to ALL posts tagged with “Lamentations of the Flame Princess.” If you had kept scrolling down from the post on Referee Screens, you would have found more posts about LotFP, one after another, descending down the page for a while. However, I was probably too generous in my Tags (it was something I had been thinking about)) and removed the tags from the Referee Screen post and another post. Yep. Sure does. Very entertaining now that I’m able to see the Lotfp stuff as well as the traveller. On another matter: if I reply to one of your earlier posts from months back do you see them? Or is it better to post a question to your most current entry? I am sent an email when someone posts, so I should see it. 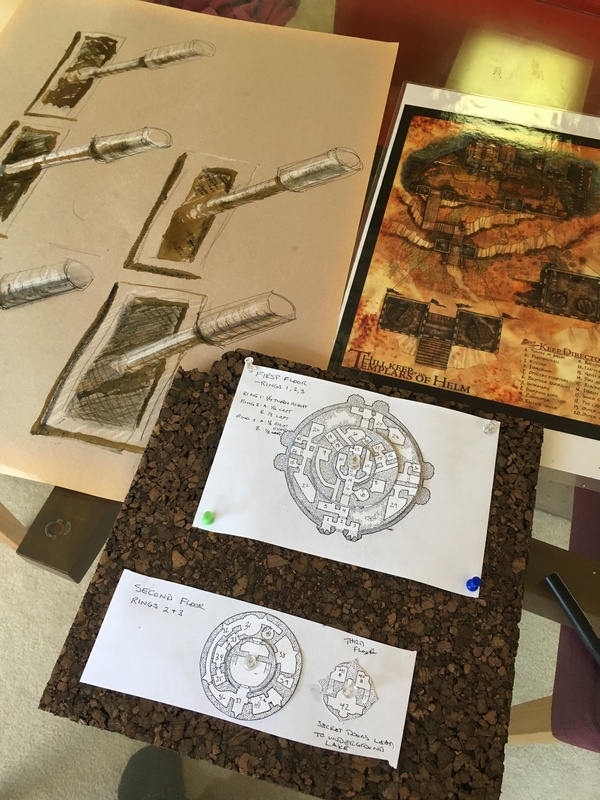 Pingback: More on the Prep for the LotFP Fallen Worlds Campaign | Tales to Astound!